Flashbulbs provide light for photography where there is insufficient "available" light, using the confined combustion of fine wires or foil within a glass capsule. Before flash bulbs, flash photography relied on openly burning powder - usually containing magnesium. In 1893, Chauffour made an ancestor of the flash bulb; this had magnesium ribbon in a glass bulb, and was fired electrically- but this had been designed for underwater photography. The first recognisable flash bulb for general use was invented in 1925 by Vierkötter - using flash powder in an evacuated light bulb, fired by a lamp filament. Later that year, Vierkötter made a low-pressure oxygen-filled bulb. There are conflicting reports of the first commercial bulbs - made either by General Electric in the US, c.1927, or the Vacublitz aluminium foil bulbs made by Ostermeier in Germany, c.1929. 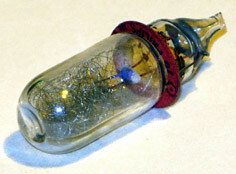 The first wire-filled bulbs are reported to have been made by Philips in the Netherlands, in 1934. Flash bulbs were individual, disposable items - used once, then discarded. 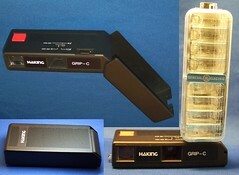 These are fitted into a flash gun, which may be a built-in to the camera, or an added-on accessory. Bulbs improved on earlier flash systems by safely enclosing the material which could otherwise throw burning embers over the subject and emit large quantities of smoke. 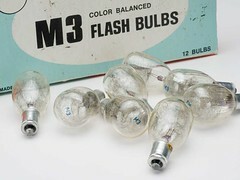 Bulbs contained various materials, often magnesium or zirconium wire or foil. Early bulbs resembled domestic light-bulbs, including a metal base with a screw (ES/Edison Screw) or bayonet (BC/Bayonet Cap) fitting. Costs were later lowered by making bulbs with wire contacts emerging from the glass, and omitting the base. 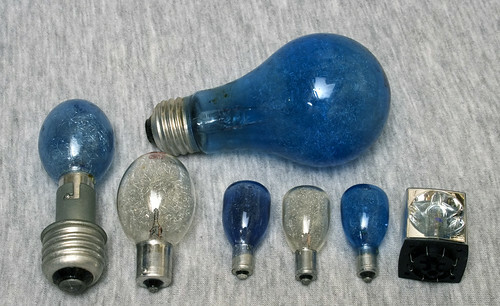 Later bulb designs incorporated plastic coatings, to try to prevent bulb bursts - or at least contain the broken glass. These coatings were usually coloured blue - to give a colour temperature closer to daylight for use with colour film. One particular cause of bursting is cracking and subsequent leakage of air into the low-pressure oxygen of the bulb; to reduce the chance of this, most bulbs had a blue indicator spot on the inside, which would change colour in air. Use of this blue spot was continued in flashcubes & magicubes. by AWCam (Image rights) Foil-filled bulbs. Flashguns often included quite high-voltage batteries to fire the bulbs; even as late as the 1960s, bulb guns could have batteries of 20 volts or more. 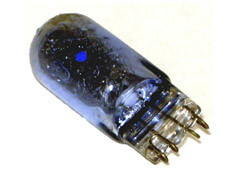 By the late 1960s, smaller bulbs were introduced such as the AG1 which could be fired by lower voltages, with many guns using only one or two 1.5v AA batteries. Virtually all disposable flash bulbs and systems have now been replaced by re-usable electronic flashguns. A very few photographers still use bulbs for special effects, or the sheer power that bulbs can produce; see, for example the flashbulbs.com link (below) for current usages and supplies. Flashes need to be synchronised to the opening of the shutter. 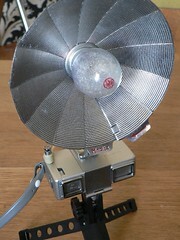 On early systems, this was done simply by opening the shutter (or removing the lens cap) and firing the flash by hand. Electrical operation allowed automatic synchronisation to the shutter. Firing early bulbs electrically required a specialised battery of around 15-25v in the flashgun or camera, although some large bulbs were designed for 110 or 240volt mains ignition. There are variations in synch requirements - see Flash sync for more details. F - Fast bulbs, with time to peak approx. 5 ms and flash duration under 10 ms (at half peak), which could be used with X synch sockets of leaf shutters at speeds up to 1/100 s.
X - a German class laying between types F and M, with time to peak of 10-18 ms and most common flash duration of 8-10 ms. These bulbs could be used with X synchronised leaf and focal plane shutters at speeds up to 1/30 s.
M - Medium fast bulbs, offering time to peak 18-20 ms and generally 8-12 ms flash duration. S - Slow burning high power bulbs with time to peak approx. 30 ms. Due to long flash duration (some 20-30 ms) S type could be used with leaf shutters at speeds not higher than 1/20 s, but had guide number significantly higher than other flashbulb types. FP - slow burning bulbs intended for synchronisation with focal plane shutters at any shutter speed. Type FT had time to peak of approx. 30-35 ms and 25-35 ms flash duration at half peak, with relatively even brightness. These consist of a number of bulbs packaged together, with an automatic method of firing the next unused bulb. 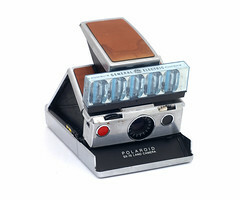 These were common on cheap, snapshot type cameras such as Instamatics and Polaroids. Bulbs could be fiddly and slow to insert into a flashgun; the wire contacts could be bent and fail to connect, and the glass could break in the fingers. The gun itself may need to be opened and closed in addition. Once fired, the bulb needed to be ejected; at this point it was hot enough to have blistered the glass and burn anything it landed on, and could sometimes have shattered into small sharp shards as it fired. Often a guard had to be removed from the gun before the bulb could be. Taking another picture required the whole process to be repeated. Various systems avoided these problems by enclosing multiple bulbs into a package - with some mechanism for automatically firing the next unused bulb. This keeps the glass and contacts away from fingers and allows rapid changes. 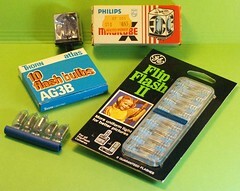 There were three major systems: Flashcubes, Magicubes and Flipflash. Flashcubes, introduced in the early 1960s, had four AG1-sized bulbs, on four sides of a cube, with a plastic reflector behind. 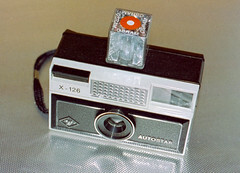 The camera had a socket to insert the cube, which would rotate as the film was wound to bring the next bulb to the front. 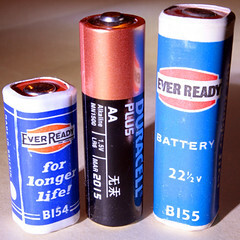 Cubes were fired electrically by lower-voltage batteries than most individual bulbs - use of two AA batteries was common. 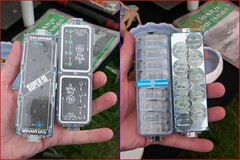 Magicubes (X-Flashcubes) were an improvement on flashcubes, introduced in 1970. They looked almost identical to the original flashcubes, but were fired mechanically by a pin sticking into a capsule of fulminating material. This simplified the system compared to flashcubes - by removing the need for a battery, and made extremely cheap flash cameras possible. 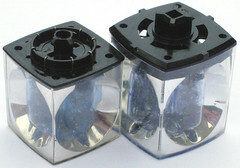 Magicube sockets appeared similar to flashcube ones, but had a slightly larger slot and were distinguished by being marked with an X - similarly the cubes themselves usually had a large X on the top - and having a pin instead of electrical contacts. slightly larger Magicube with holes for firing pin. Flipflash featured an array of 8 or 10 bulbs in a flat rectangular arrangement, each bulb placed horizontally, one above the other. Fuses selected the next bulb to fire; when half the bulbs were used, the photographer had to invert the Flipflash - which had a connector on both ends - to use the remainder (hence the name). The camera had a small rectangular socket to mount the Flipflash. Topflash was very similar to Flipflash, but placed the bulbs vertically, two per row in an 2×4 arrangement. Another Flipflash variation. Flash Bar bulbs were placed vertically, and arranged next to each other horizontally. Both sides had bulbs, the bar being rotated to use the other side. Flip Flash bulbs were arranged in a zig-zag manner. Sylvania also made a Polaroid bar arrangement. ↑ Wightman, Eugene P., 'Photoflash' (archived), in Image, Journal of Photography of the George Eastman House, Vol. IV, No. 7 (October 1955), pp 49-50; reproduced as a pdf at GEH. ↑ British Patent 272394, Improvements in or relating to flash-light devices suitable for photographic purposes, filed 14 December 1926 and granted 16 June 1927 to Paul Vierkotter (spelt here without the umlaut), archived at Espacenet, the patent search facility of the European Patent Office. The article in Image magazine, cited above, refers to a German patent of 1925. Magicube & Flashcube Photos + Tech Data on Flashbulbs.com - a current flashbulb supplier! Data on other bulbs here too. This page was last edited on 14 August 2018, at 05:30.